GERMANY struggled with nerves in the opening period but, for the second night in a row, enjoyed a three-goal burst in the second session and skated their way to a decisive 8-2 decision over the national ice hockey team of NORWAY in an exhibition match at Dresden. Olympic forward MARCEL MUELLER of EC Koeln gave Germany a bright enough start with a goal in the fifth minute of the match. The plucky Norwegians proceeded to put two pucks quickly past debutant PATRICK EHELECHNER of the Nuernberg Ice Tigers in the German goal, however. Former junior international ROBIN DAHLSTROM of IF Frisk Asker, only fifteen seconds after Mueller’s goal, and Norwegian Olympian KRISTIAN FORSBERG of Swedish club Mo Do Ornskoldsvik left the home-standing Germans behind with just eight and a half minutes gone. But, the versatile CONSTANTIN BRAUN of Eisbaeren Berlin would step into the breach before 3,087 Zuschauer at the Freiberger Arena in Saxony. 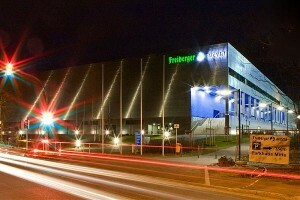 The FREIBERGER ARENA, located in the historical German city of Dresden, is home to second division side ESC Dresdner Eisloewen, the Ice Lions. The facility was completed at a reported cost of 29.7 million Euros and has an official capacity of 4,127 for ice hockey with fixed seats accounting for 3,099 of the total. The first-ever game at the Freiberger Arena featured Eisbaeren Berlin contesting Czech Republic club HC Karlovy Vary in August of 2007. Braun, often employed in attack by Eisbaeren Berlin, was deployed on defense by national team head coach UWE KRUPP and struck twice seven minutes apart in the latter half of the opening period to set Germany off on a seven-goal rampage.